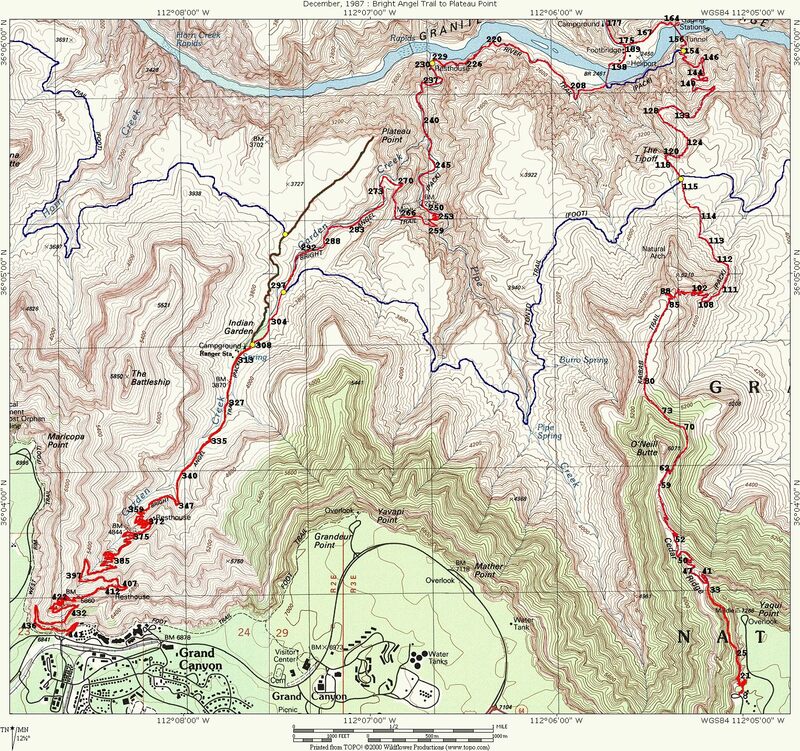 The map at the left shows the detailed view of the second part of the virtual hike. 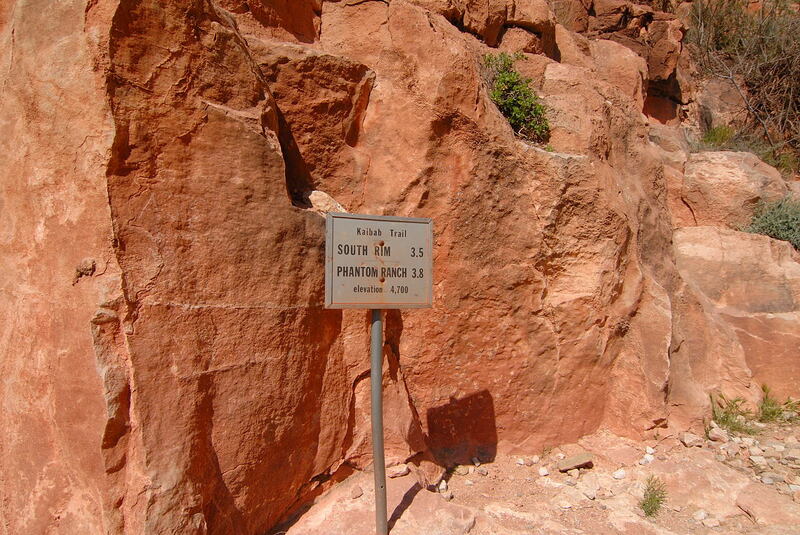 The pictures are numbered to indicate the locations where they were taken. Most of these locations are fairly accurate, but there are some that I must admit are just "best guesses." 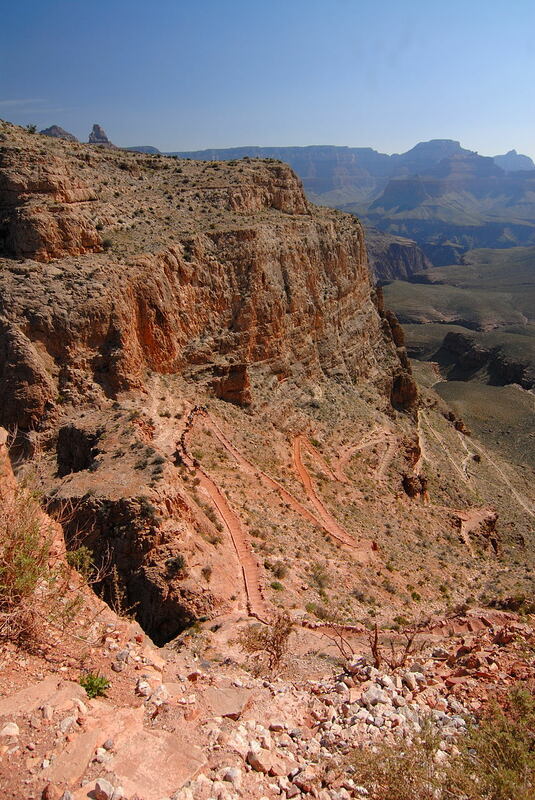 Just beyond Skeleton Point the fairly flat trail goes over what would otherwise be a cliff, but the trail makes almost a dozen switchbacks to descend this steep section. 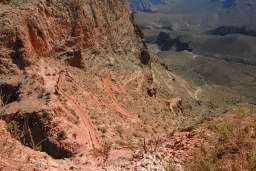 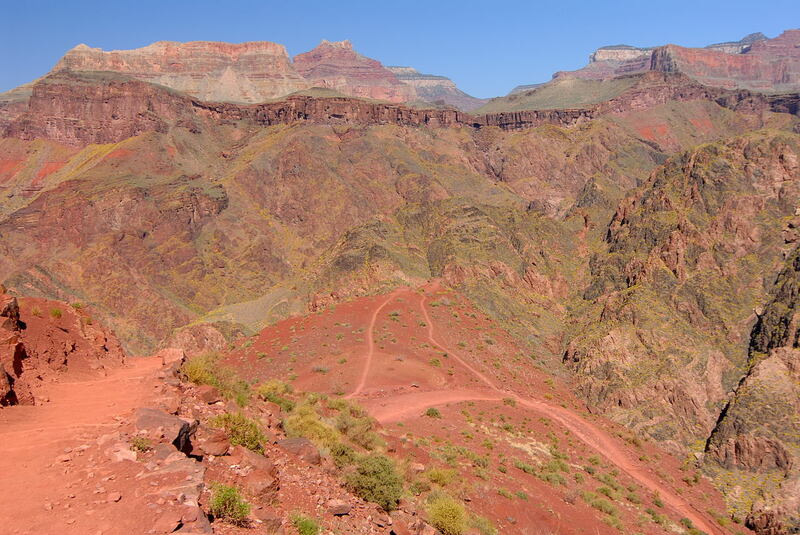 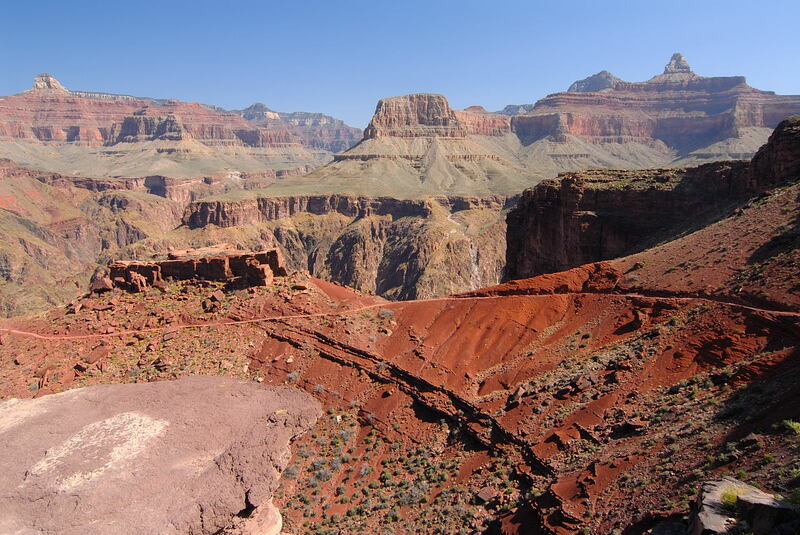 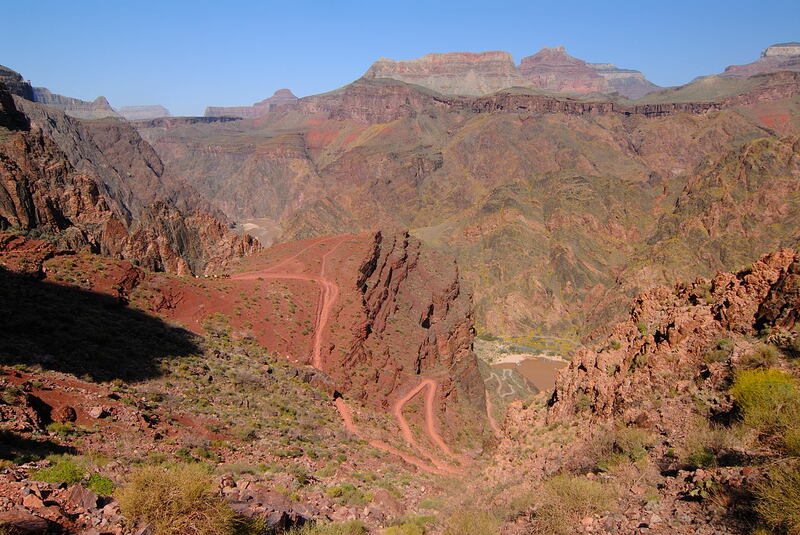 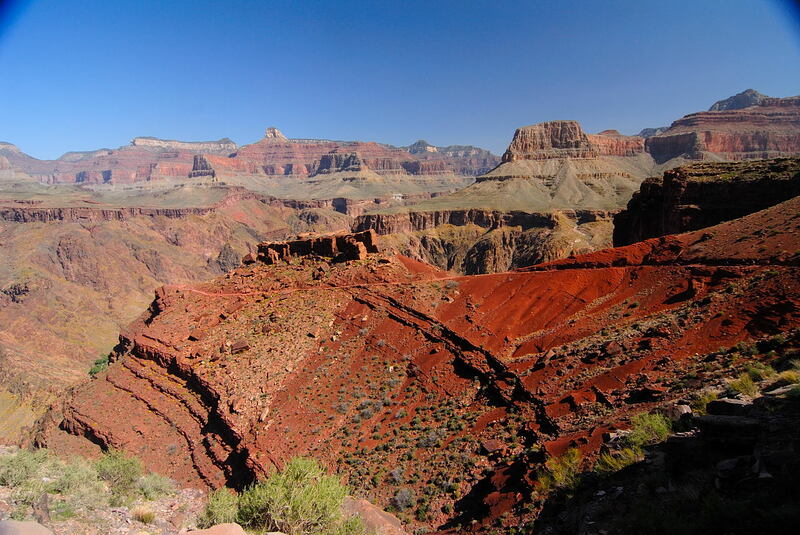 The view of these switchbacks is one of the spectacular views on the South Kaibab. 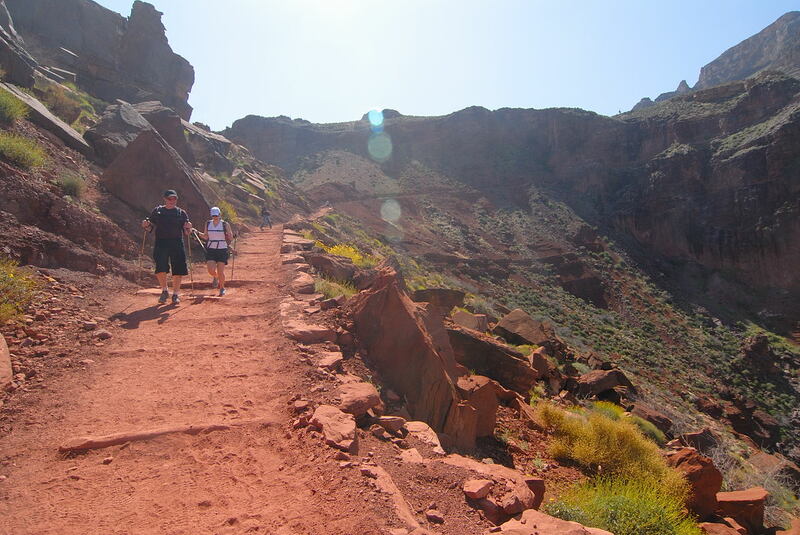 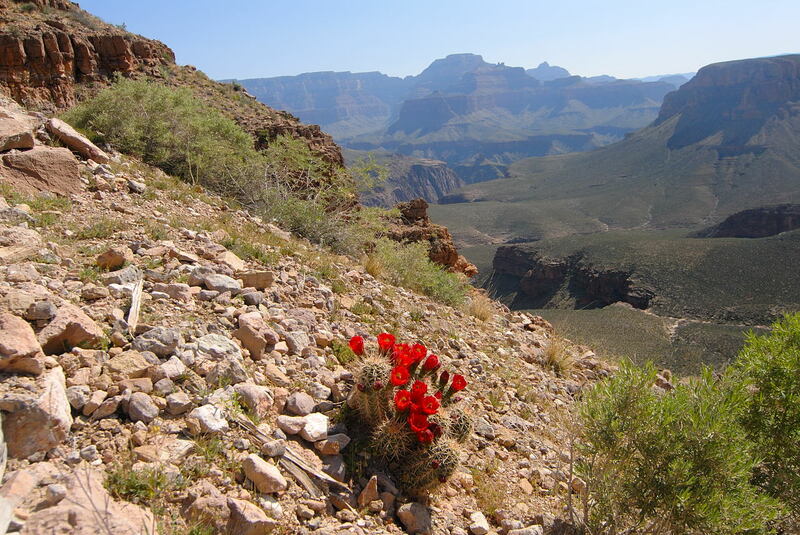 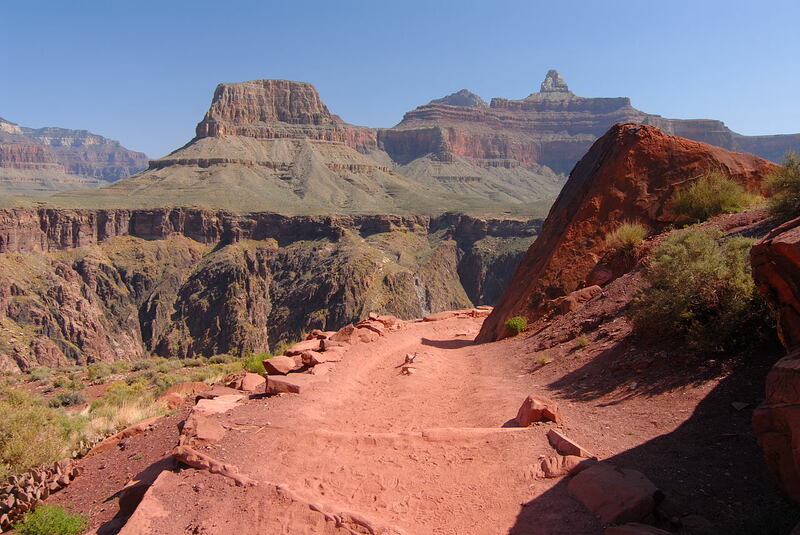 These are killers for anyone attempting a climb up the South Kaibab! If you are doing a day hike and temporarily ignored the advice of stopping at Skeleton Point, these switchbacks are an instant reminder: are you sure you want to do this? 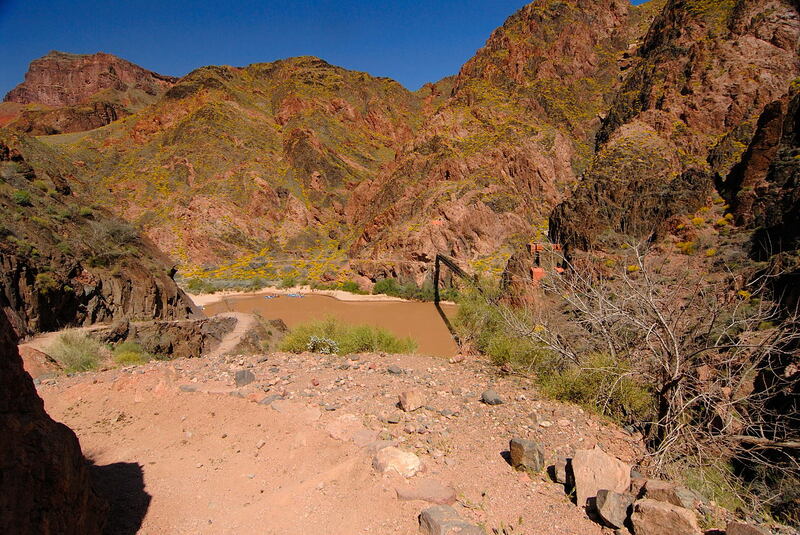 This is the first spot on the trail where you get a look (though just a glimpse) at the Colorado River. 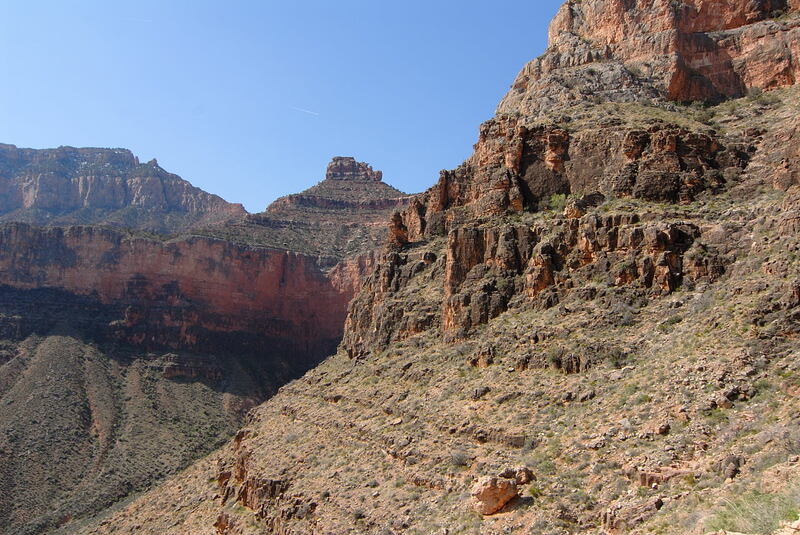 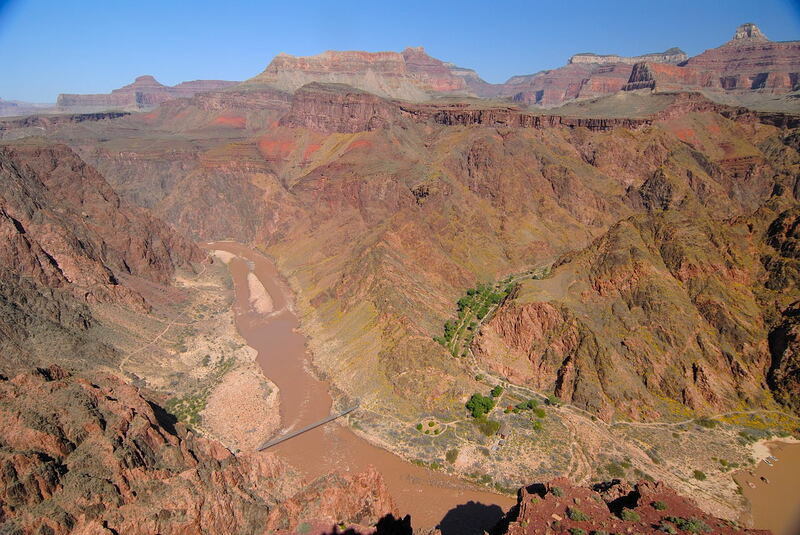 For all practical purposes, Skeleton Point is about the midpoint of the South Kaibab. 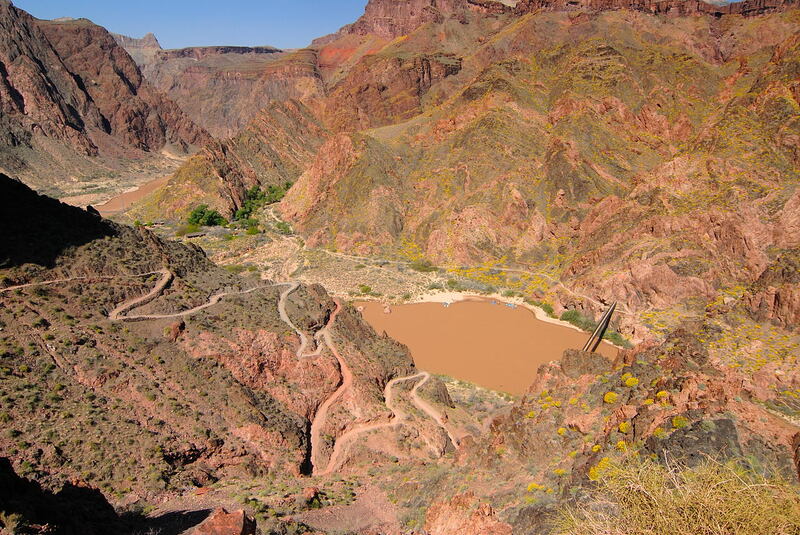 About at this spot we are at the halfway point down the SK. 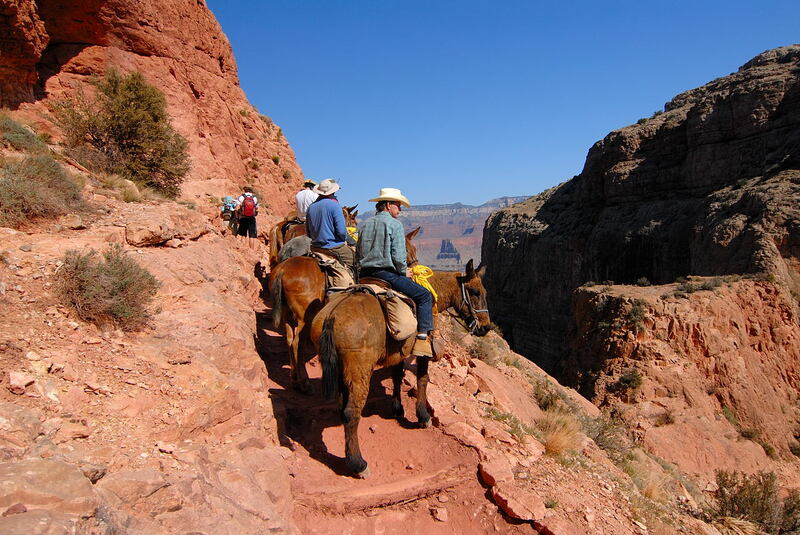 The trail's width can be said to be one mule wide! 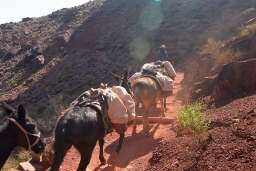 The mules are the professional climbers on the trails and they have the undisputed right of way. Especially when hiking during the morning, you are bound to encounter mules. 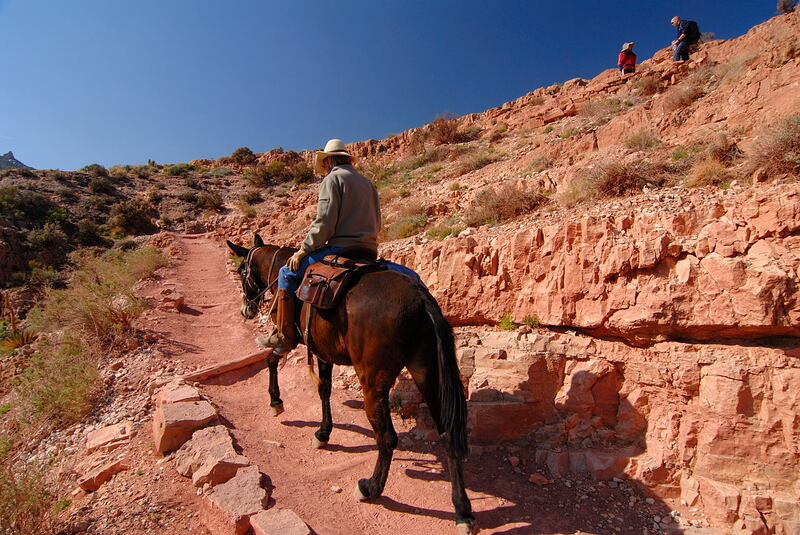 On the SK in the morning, I've only encountered them when they're coming up from the bottom. 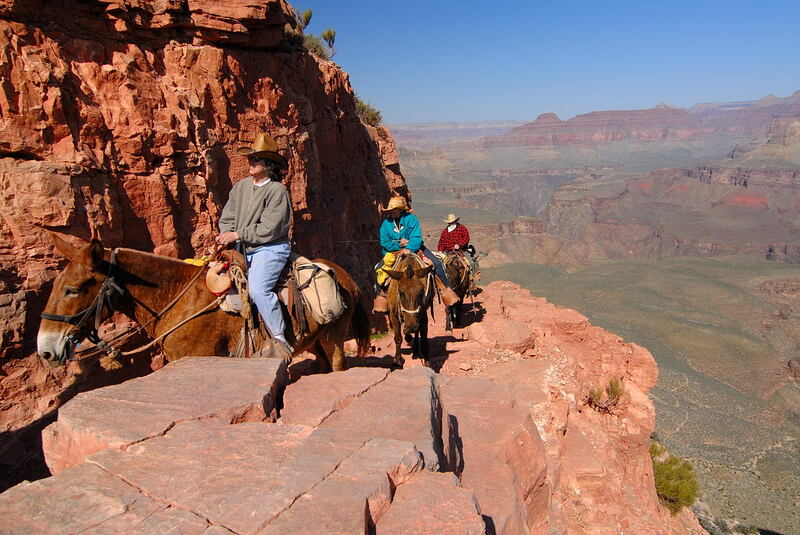 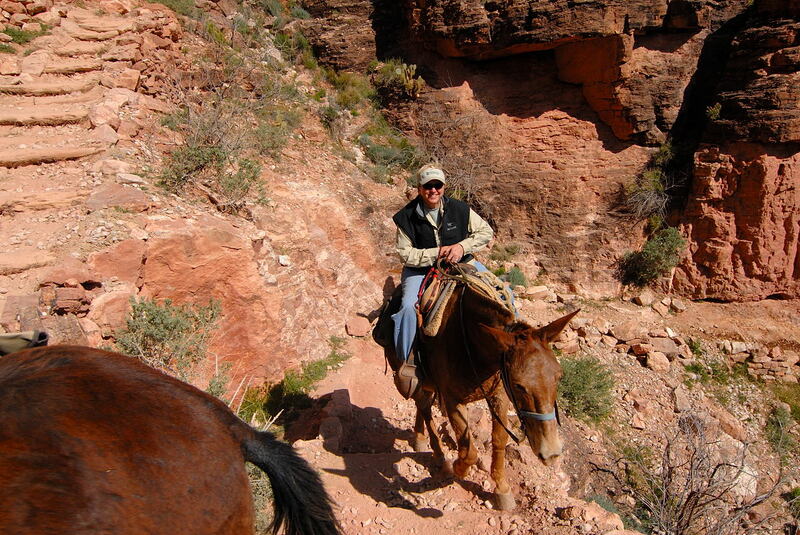 Take note the mules are always pointing into the canyon when they stop for safety reasons. 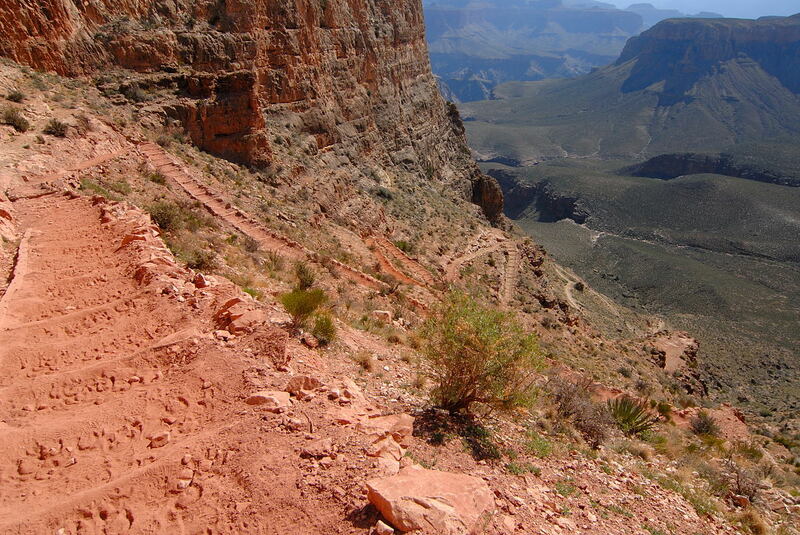 Looking back up at the switchbacks you'll notice that they really blend in. 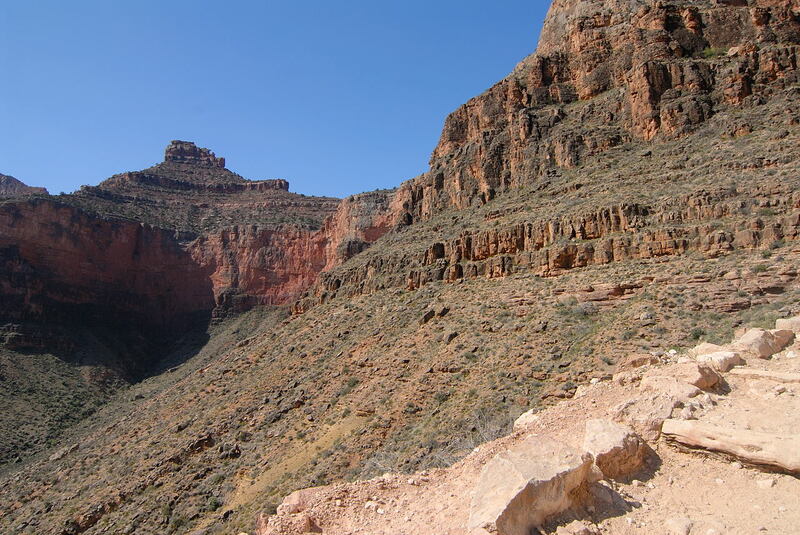 In this picture in the distance you can see the backside of O'Neill Butte. 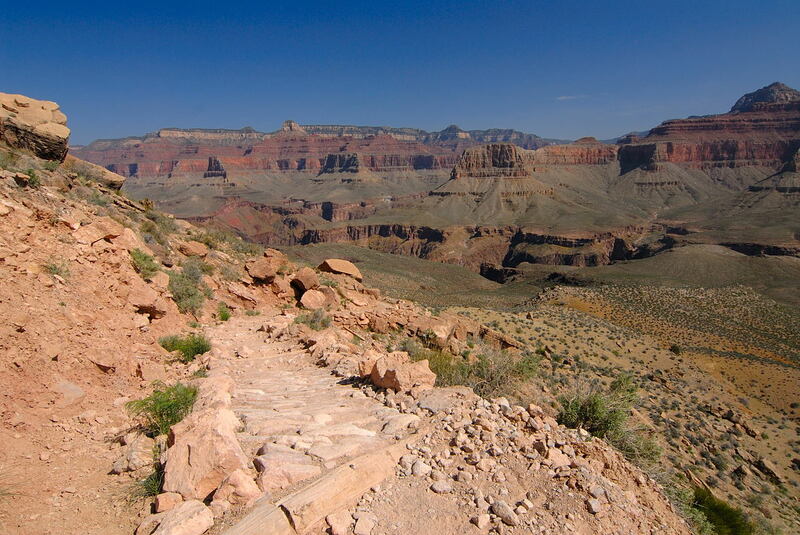 Even in the close-up view the trail that traverses it is completely invisible. 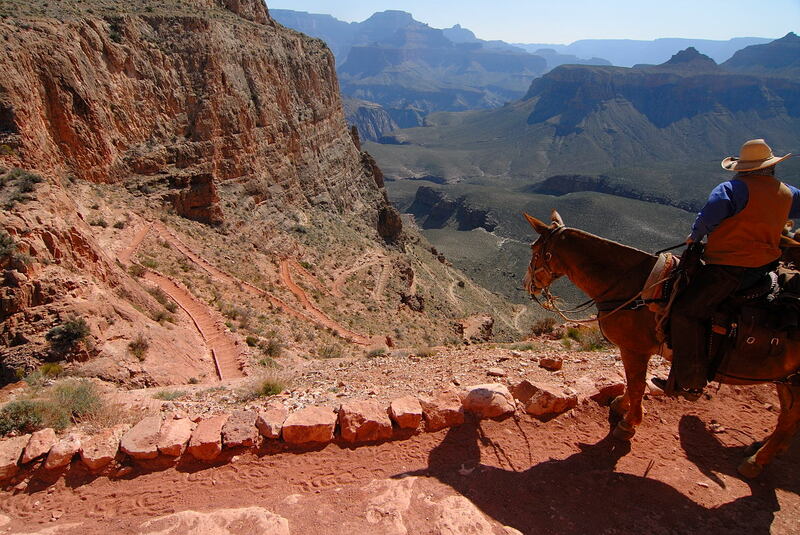 From this angle it looks like you would fall right off into the canyon below! When you reach the bottom of the long switchbacks you've arrived on the Tonto Plateau and the trail flattens once again. 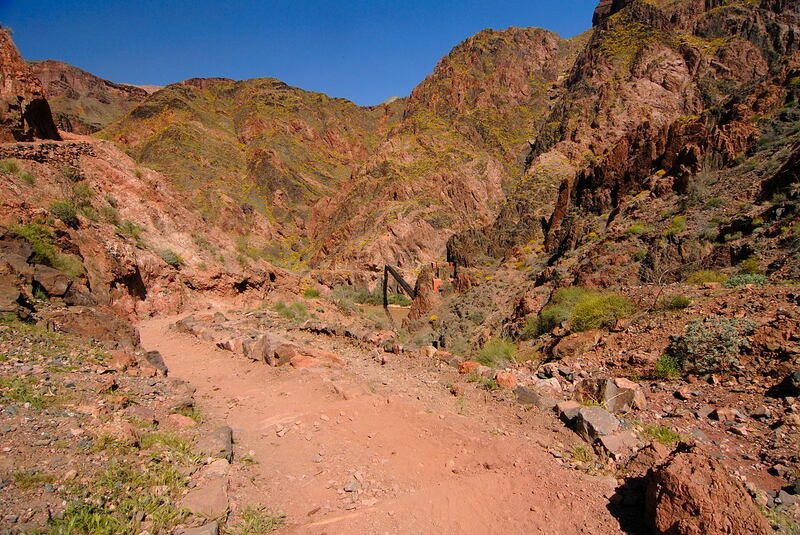 This is the most desolate section of the entire trail. 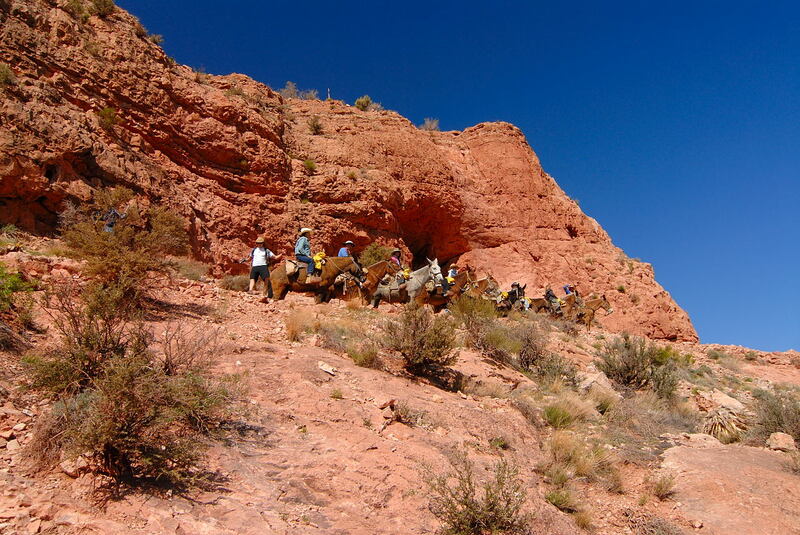 At the left is the father-son team of Craig & Ben who I passed at this point. 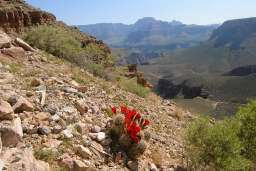 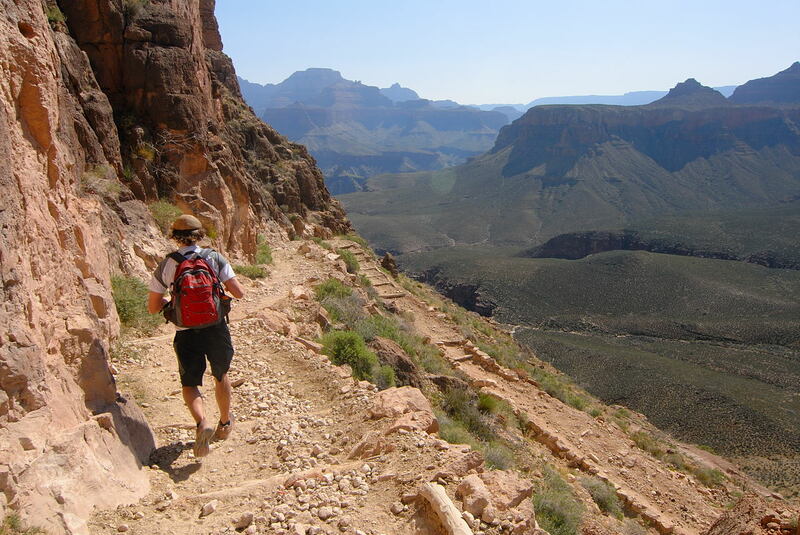 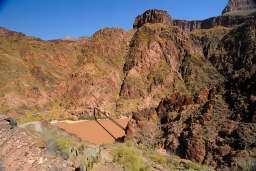 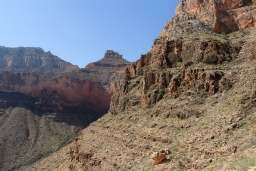 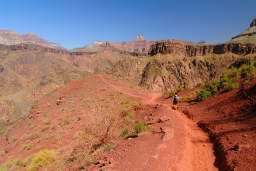 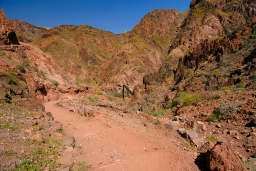 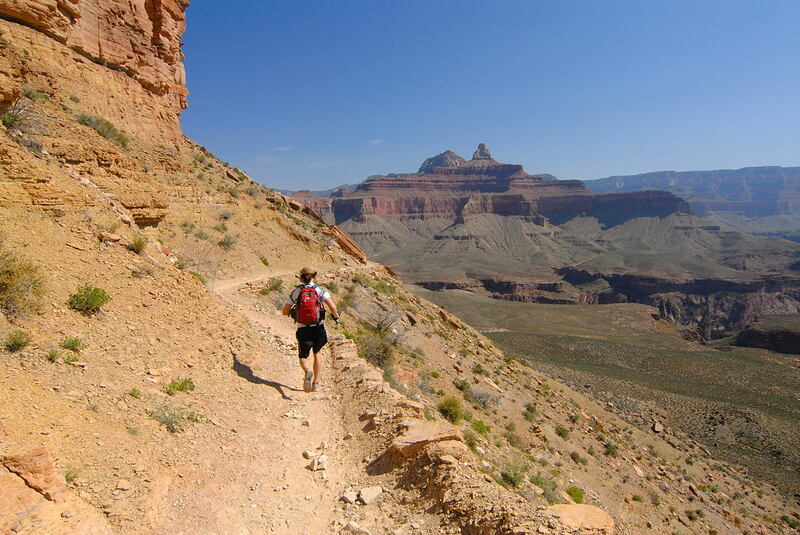 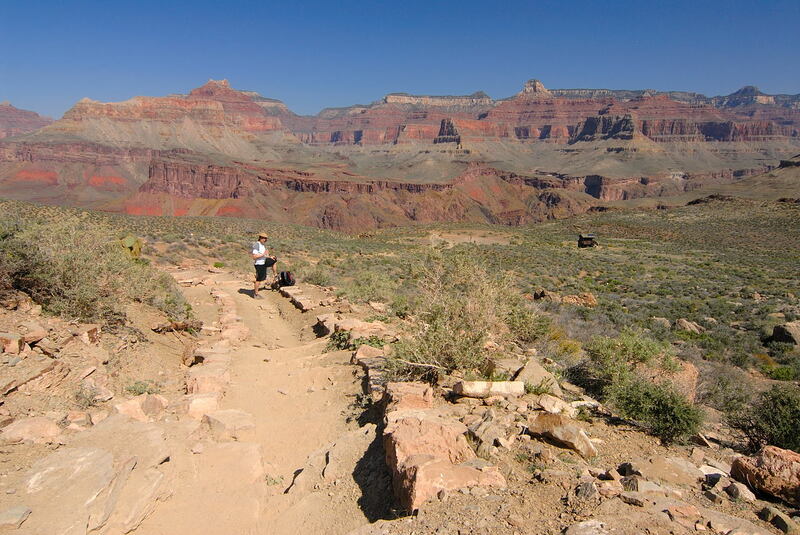 Craig wrote to me soon after saying, "You ran past me and my son a week ago Sunday on the South Kaibab Trail and then stopped to take a picture and ran backwards while telling us where we could go on the net to see your photos." 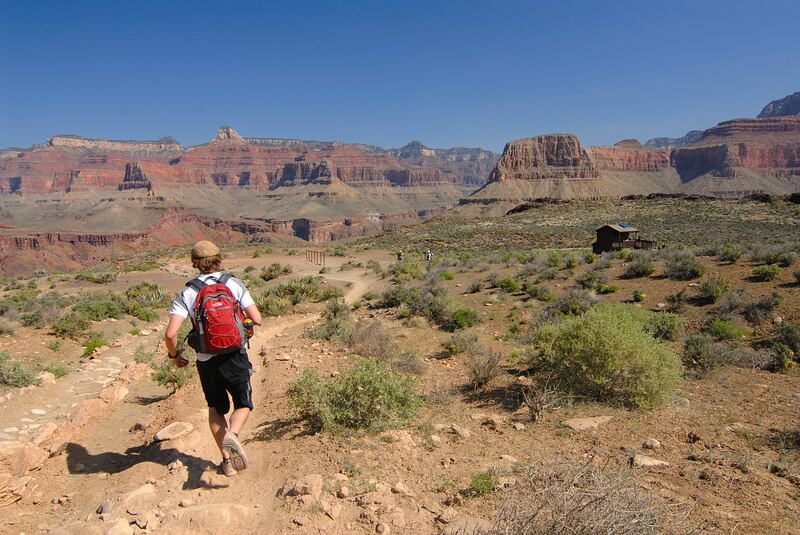 Running backward? 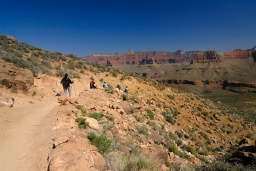 I'm pretty sure the park service really discourages this! 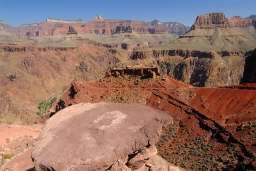 What kind of fun were they having? 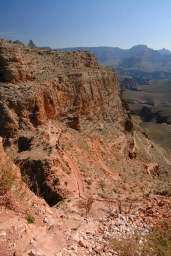 Craig wrote, "Ben and I were having the time of our lives there." 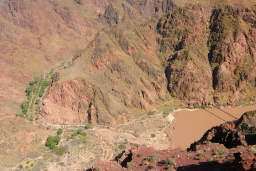 The Tonto Plateau ends at a point known as The Tipoff. 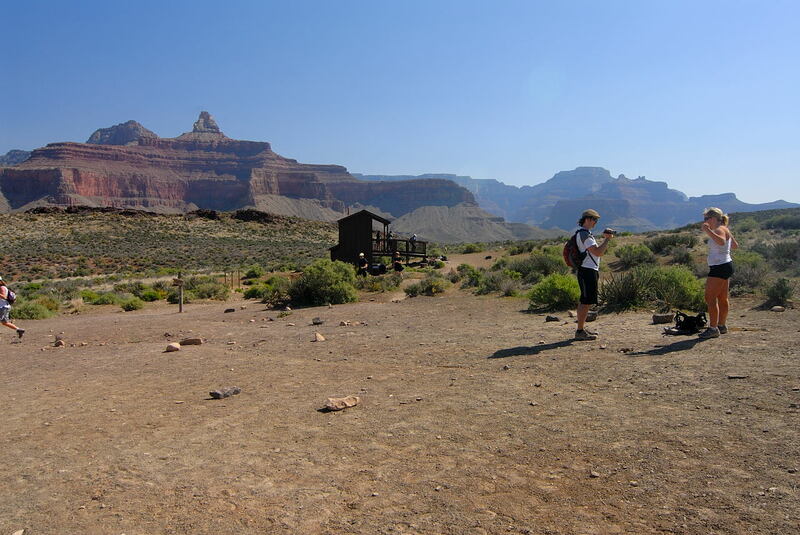 There is a rest house and a hitching post, but no water. 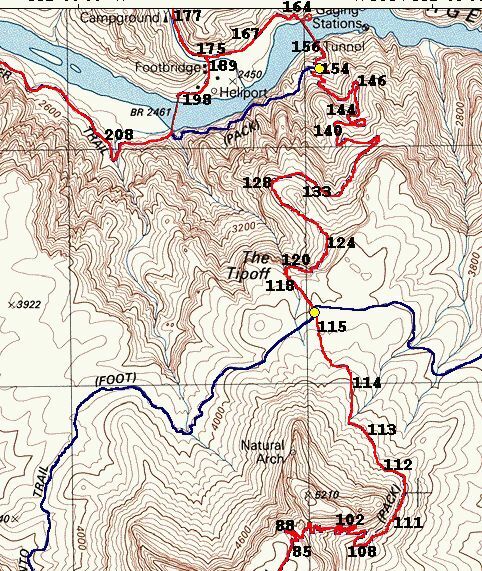 We have traveled 4.4 miles at this point, just over a quarter of the total distance. 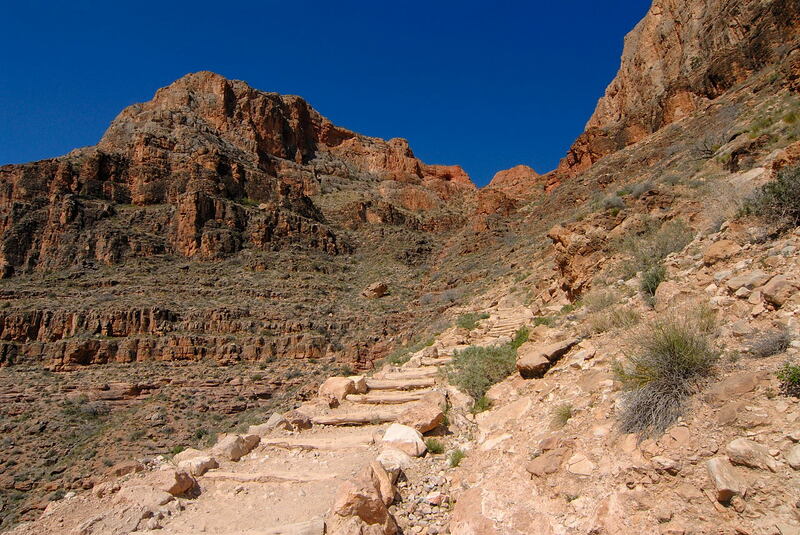 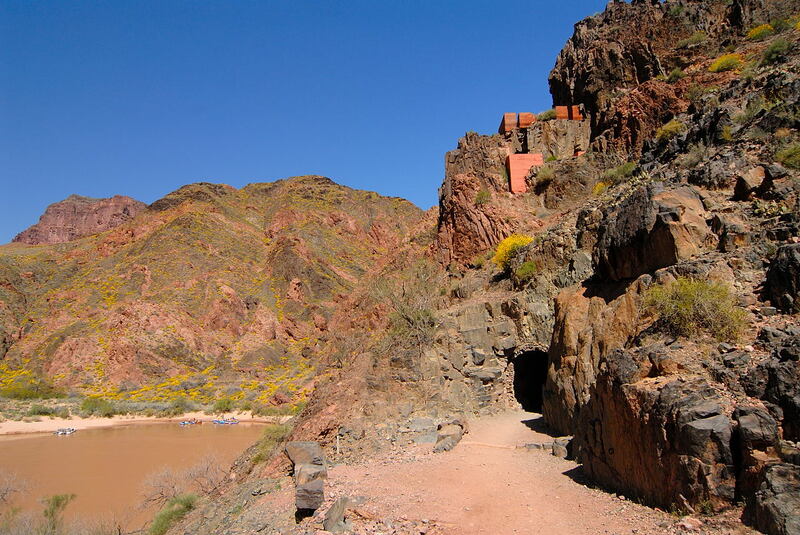 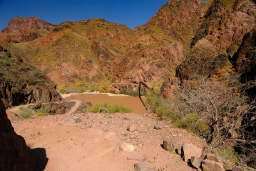 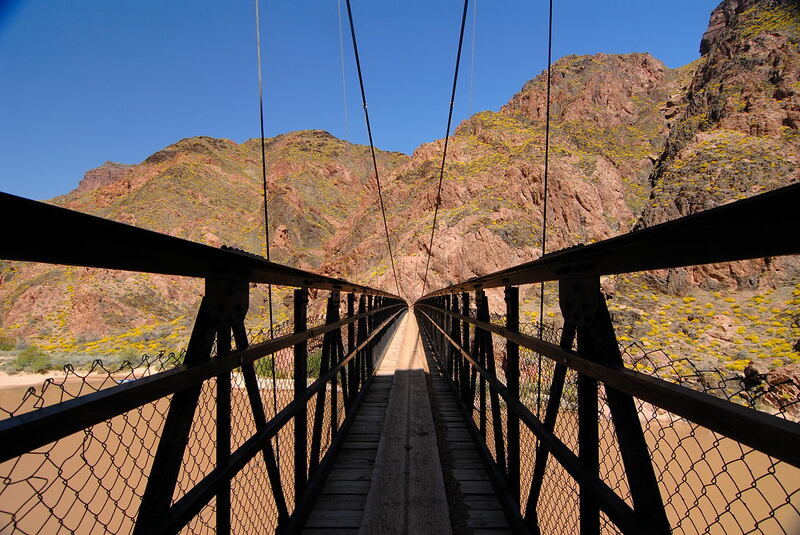 What lies just ahead is the inner gorge of the canyon, also known as Granite Gorge. 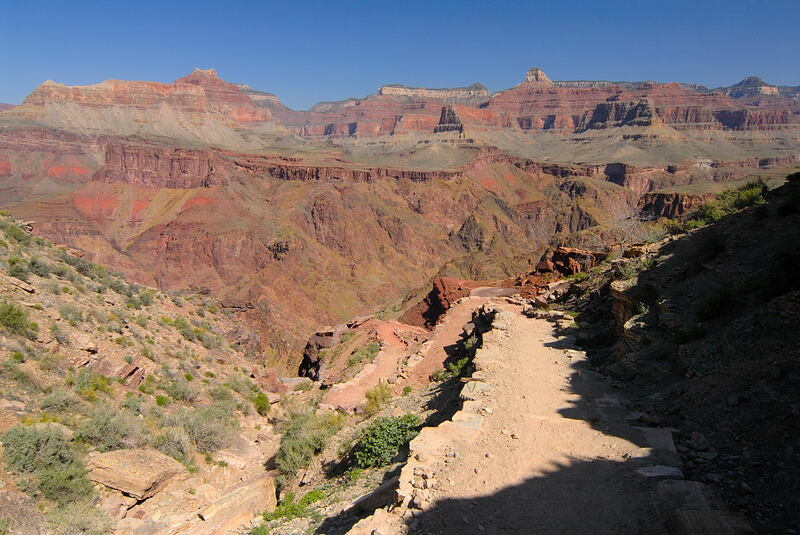 As you enter the inner gorge you are greeted with a few of the trail I call "The Great Arc" as the path makes a 180 degree curve in what really looks like a half crater. 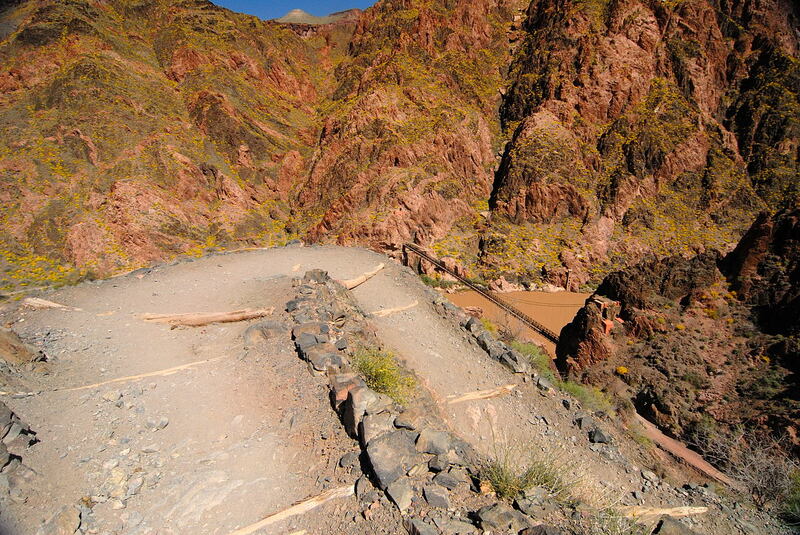 At the end of this big arc which you can see in the picture at the left is a very special spot called Panorama Point. 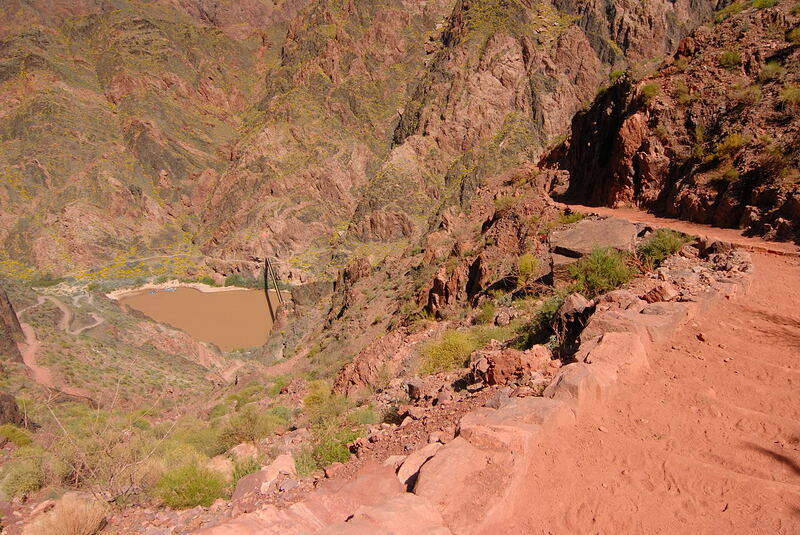 I specifically mention this because the actual lookout is some 30 feet off the trail and easy to miss! 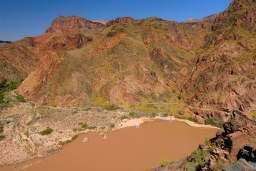 I myself missed it on my first two hikes down the canyon and only found out about it because of pictures posted on the internet. 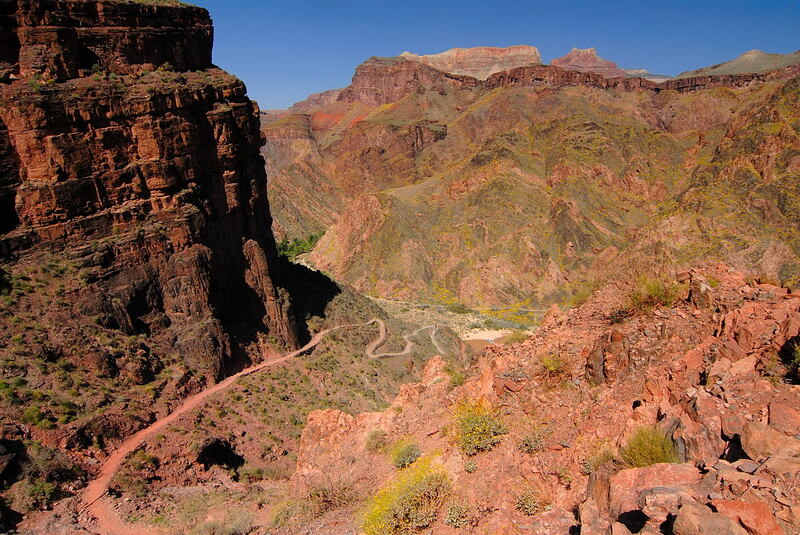 And do you really want to miss a location they've labeled Panorama Point? 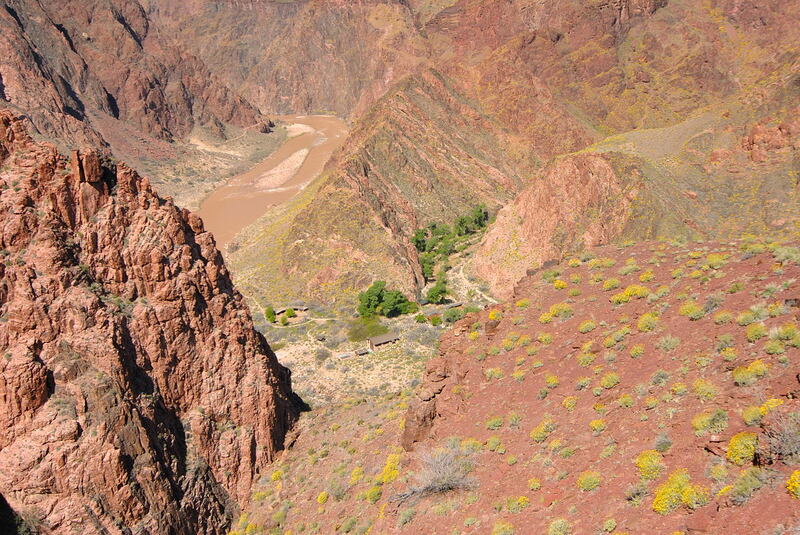 You will also notice in this picture a path of green in the canyon below. 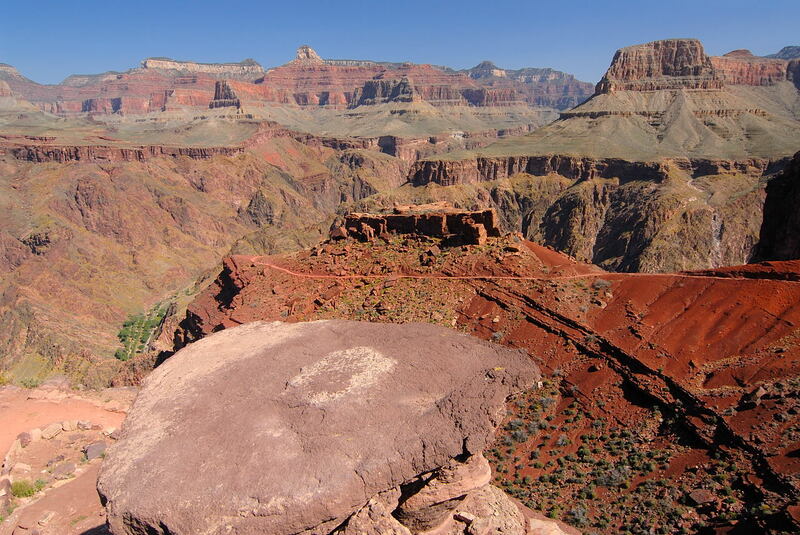 This is Bright Angel Campground and you'll get a good look at that from Panorama Point. 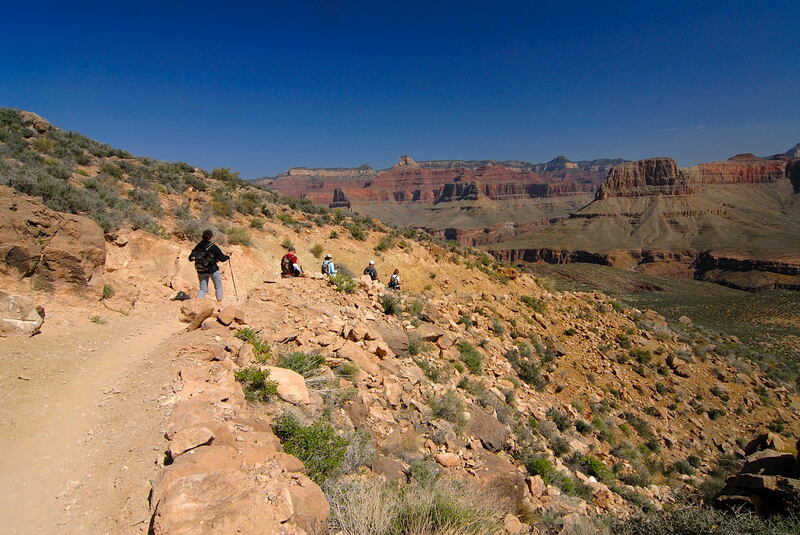 We have arrived at Panorama Point. 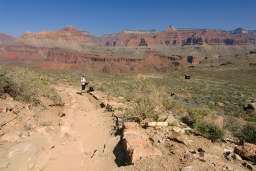 Note from this picture that the point is off the trail and not marked! 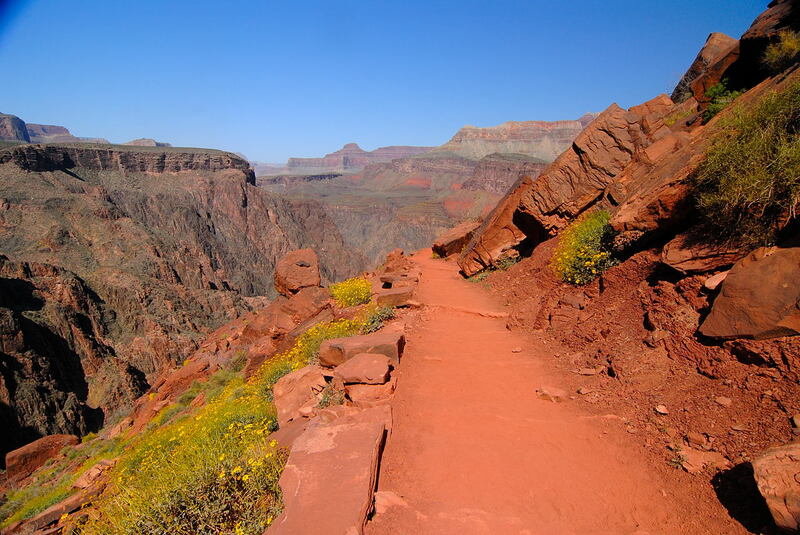 The path leading from from the trail is very lightly worn, an indication that it's lightly visited because most hikers go right by this spot. 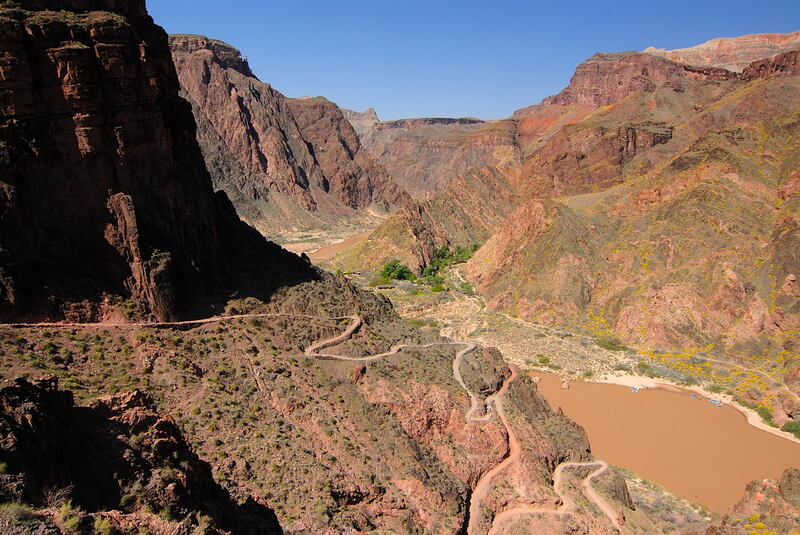 The pictures below show the spectacular bird's-eye view from this lookout point less than a half mile into the Inner Gorge. 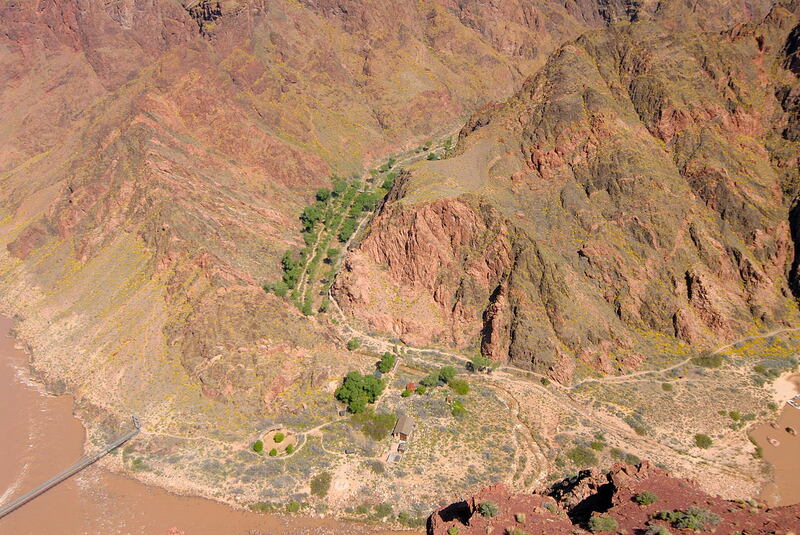 The pictures dramatically show the steepness and you feel (and really are) right on top of the river. 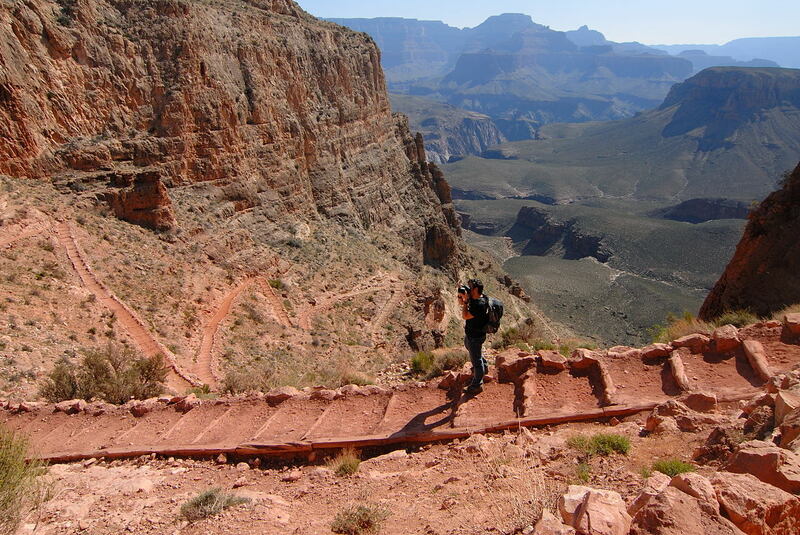 If you have a fear of heights, approach carefully. 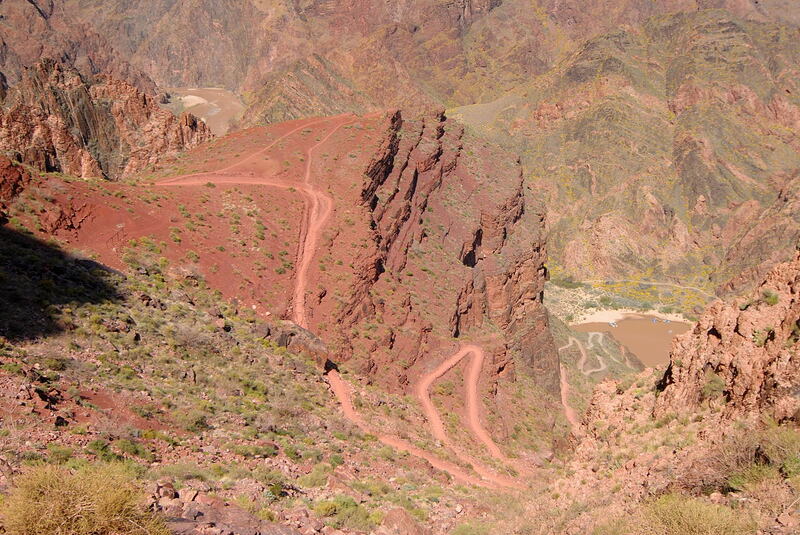 If you have a severe fear of heights, you will want to avoid Panorama Point. 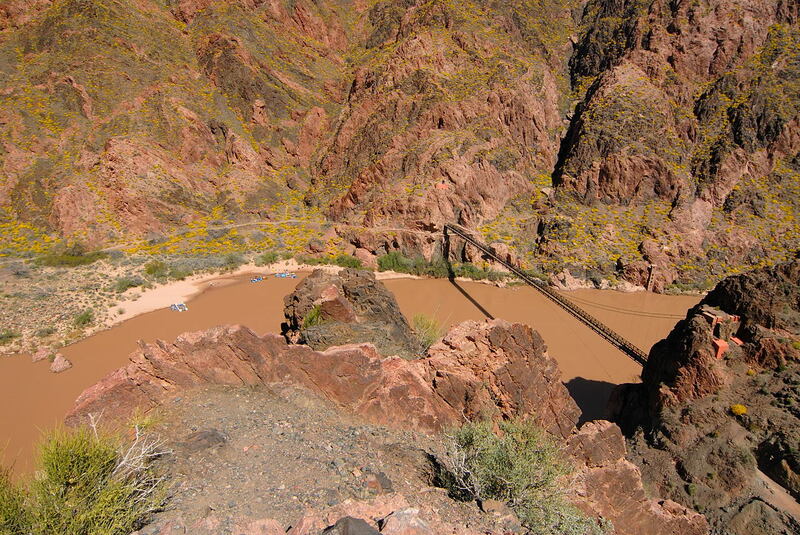 From here you can see the trail from Black Bridge to Silver Bridge which you will be traversing soon. 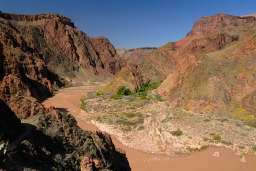 Also visible is Boat Beach, Bright Angel Creek and the Bright Angel Campground. 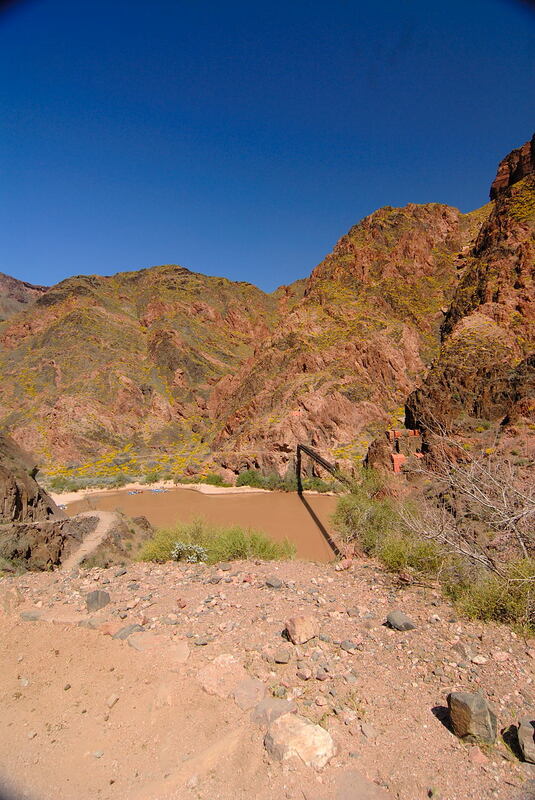 Phantom Ranch is not visible as it lies beyond the campground behind the mountains. 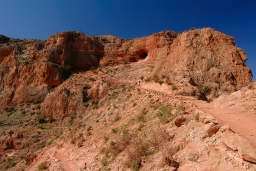 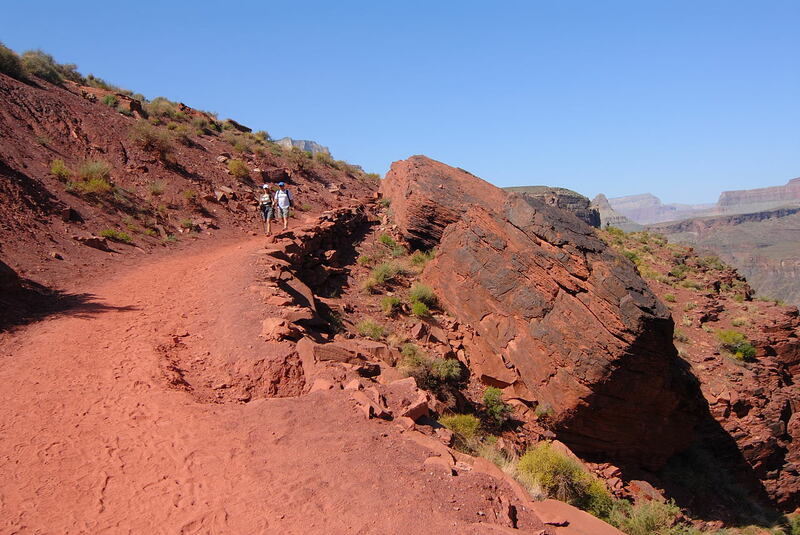 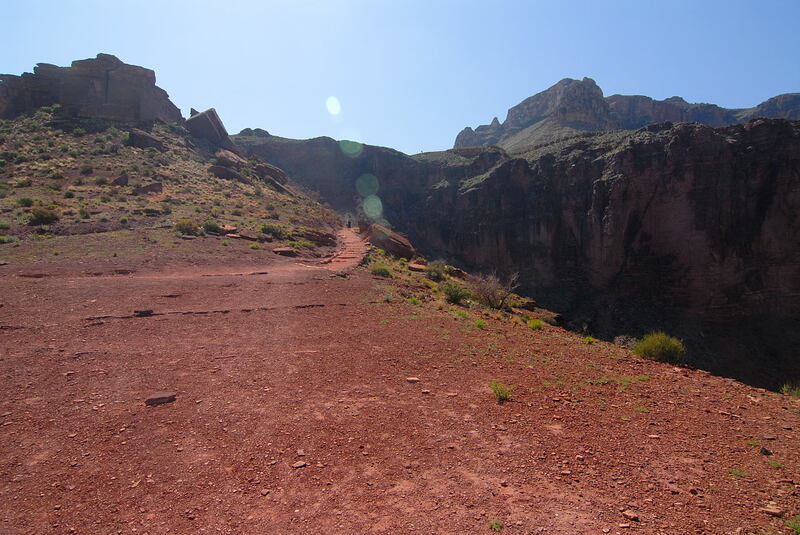 As you can probably tell from the photos, the trail in the Inner Gorge is a fine reddish dust that gets on your shoes and socks. 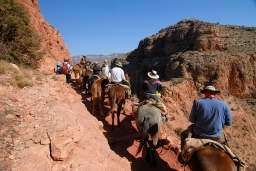 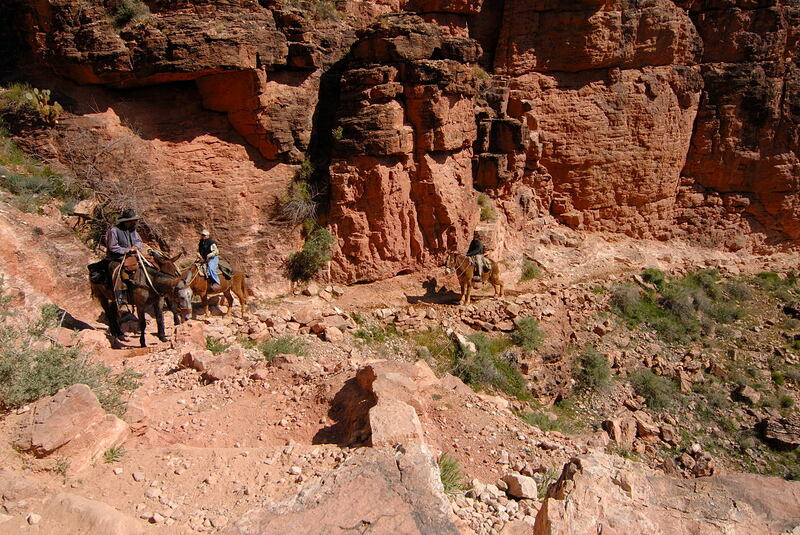 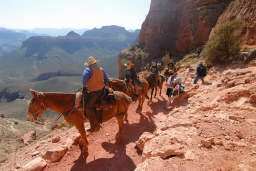 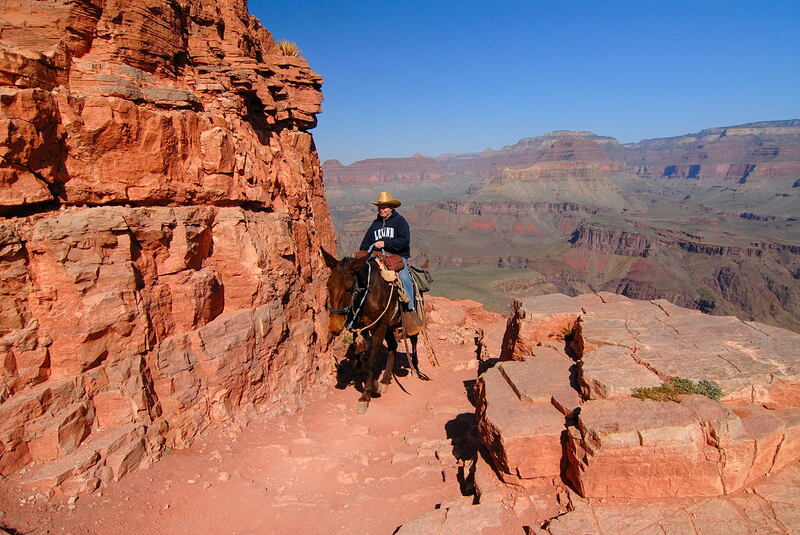 Visitors taking the mule trip on this part of the trail often dawn their handkerchiefs. 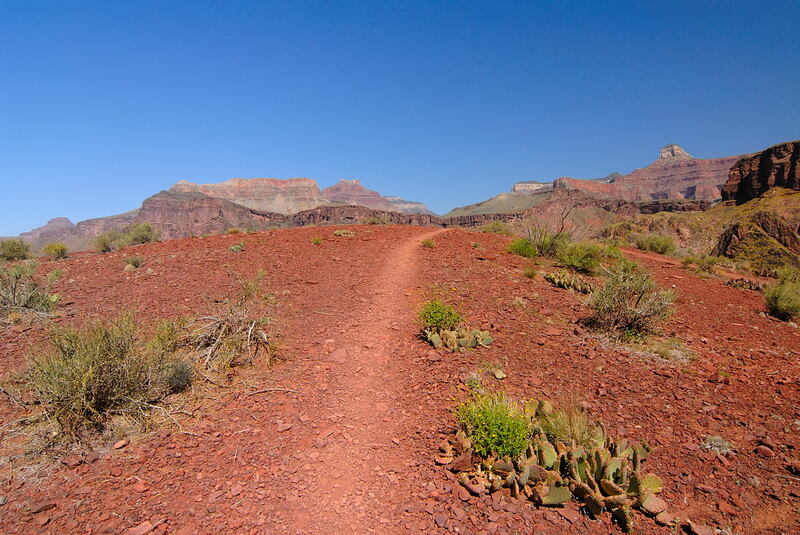 This part of the trail can feel pretty lonely, especially in the early morning when it is still in the shadows. 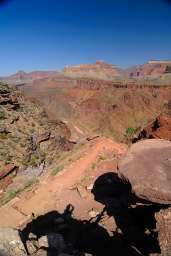 Also, for the first time you'll also appreciate the shadows when you get them. 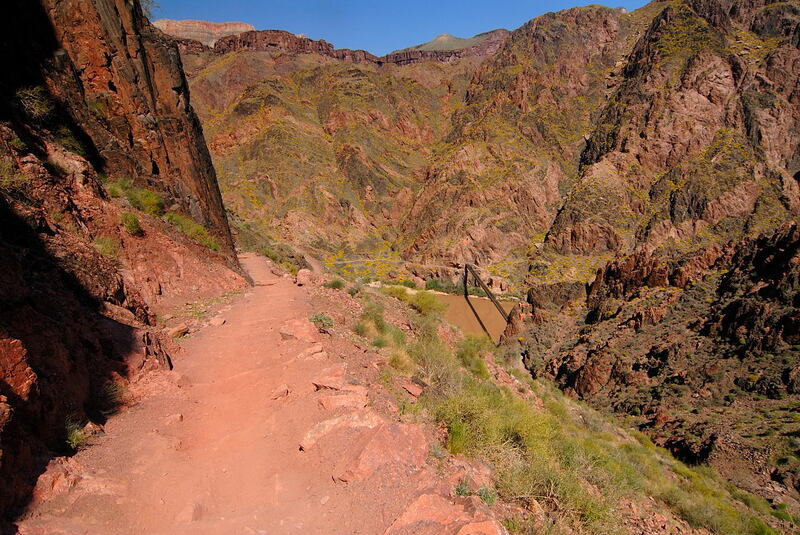 If it hasn't felt warm, that feeling will begin when you hit the Inner Gorge. 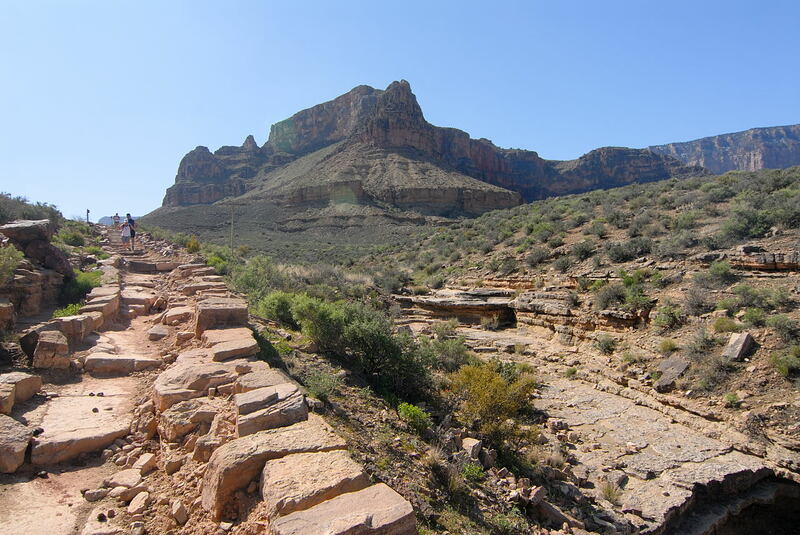 Just before reaching the tunnel that will lead you onto Black Bridge, you pass the River Trail turnoff. 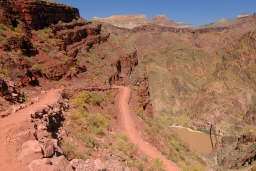 You could turn left at this spot and get over to the Bright Angel Trail, but I don't think many take this option because just a little farther down and you're at the river. 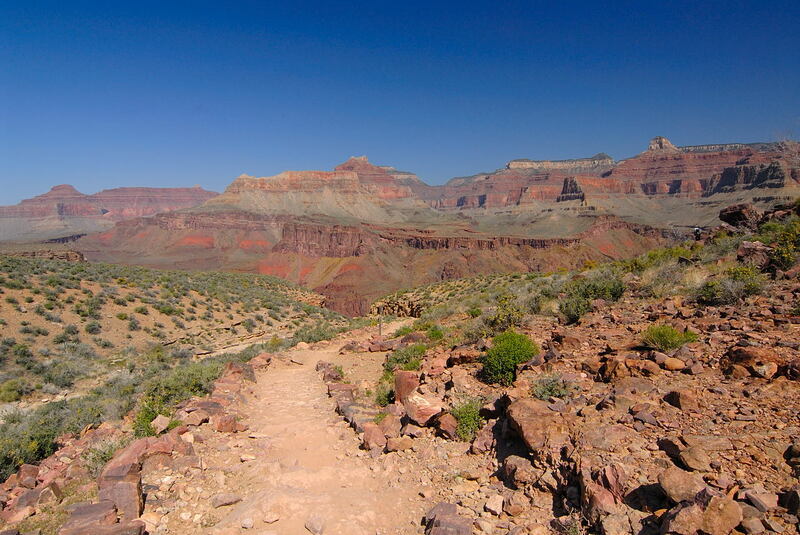 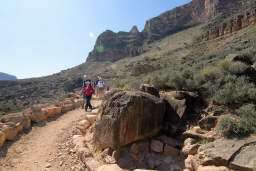 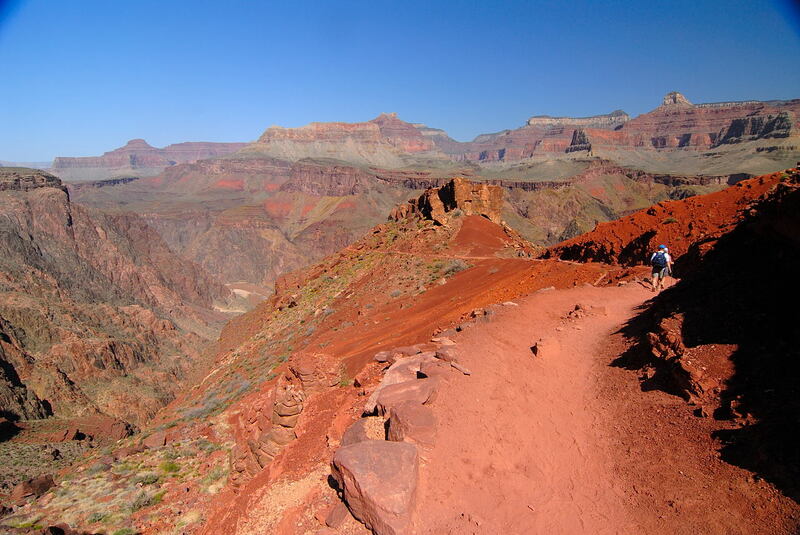 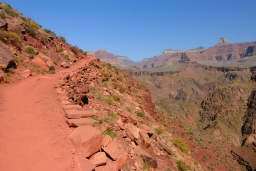 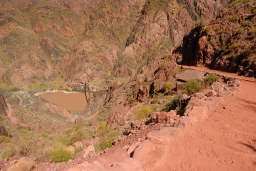 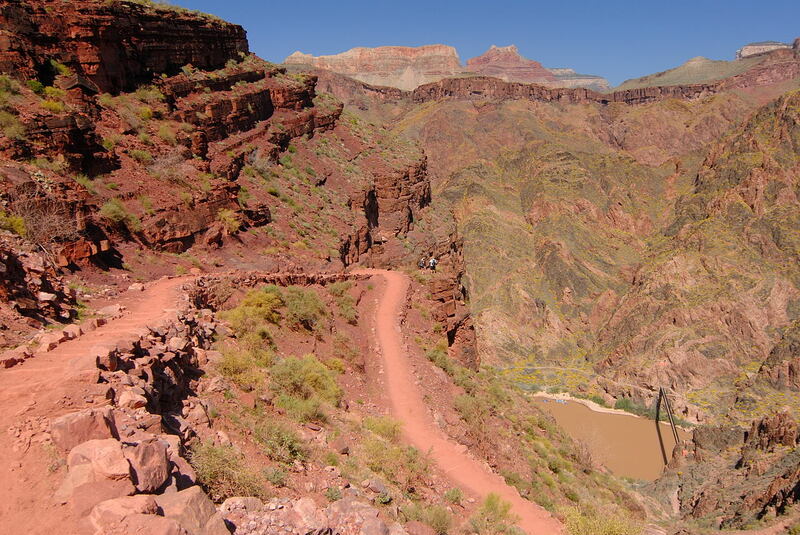 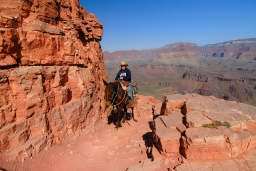 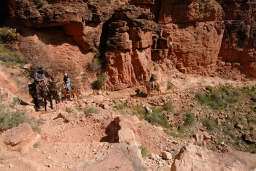 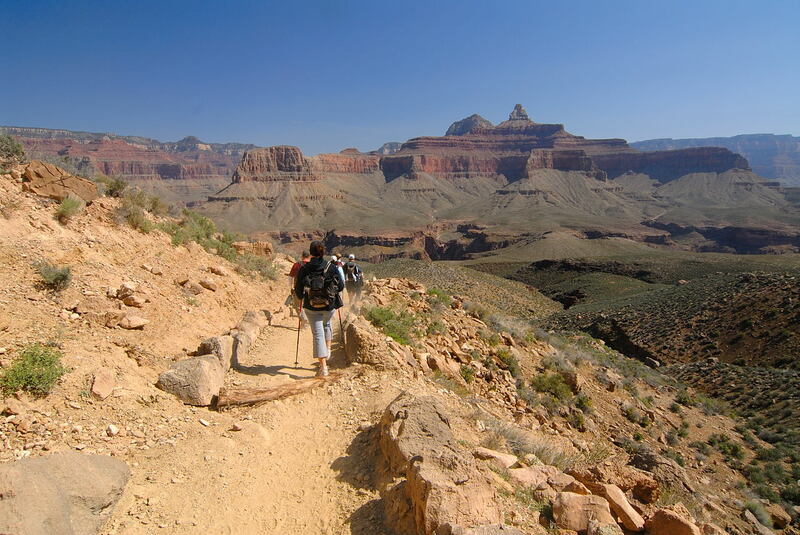 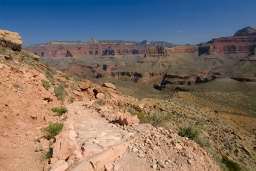 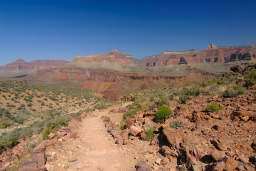 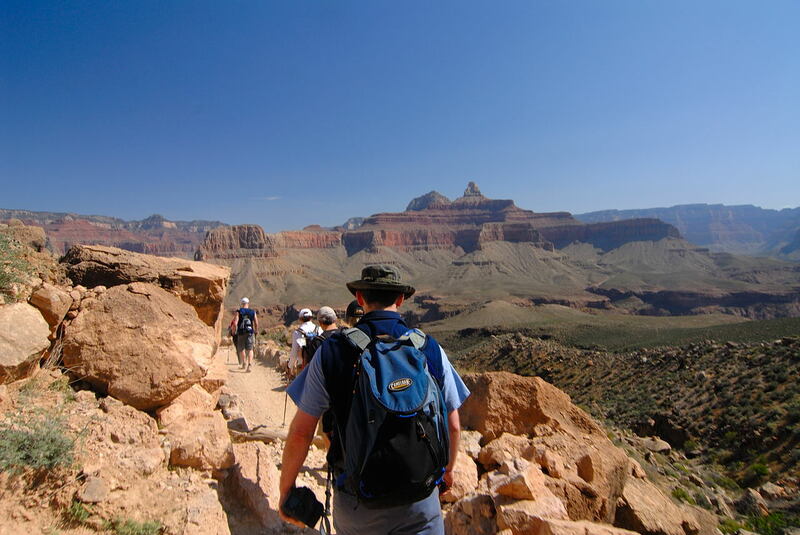 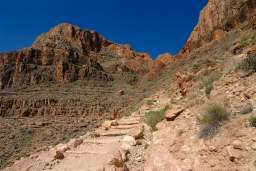 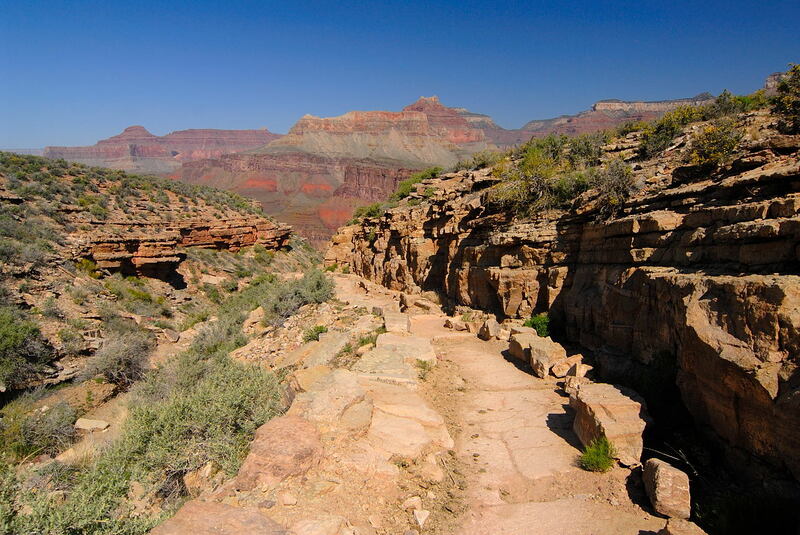 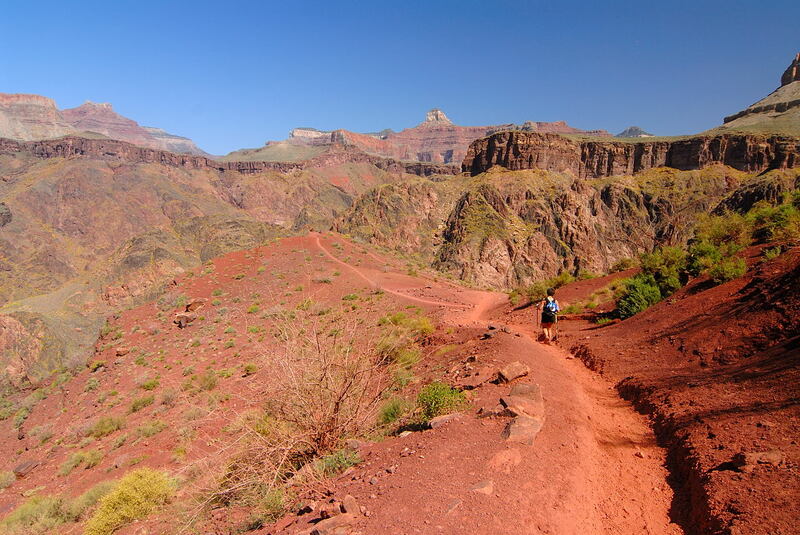 For me the South Kaibab Trail ends when you arrive on Black Bridge although it technically it doesn't until you hit the Bright Angel Campground. We've arrived at the river, but still 4 more pages to complete the entire tour. 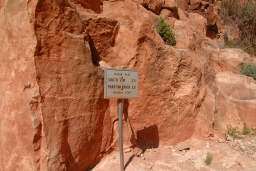 To continue on hit next.